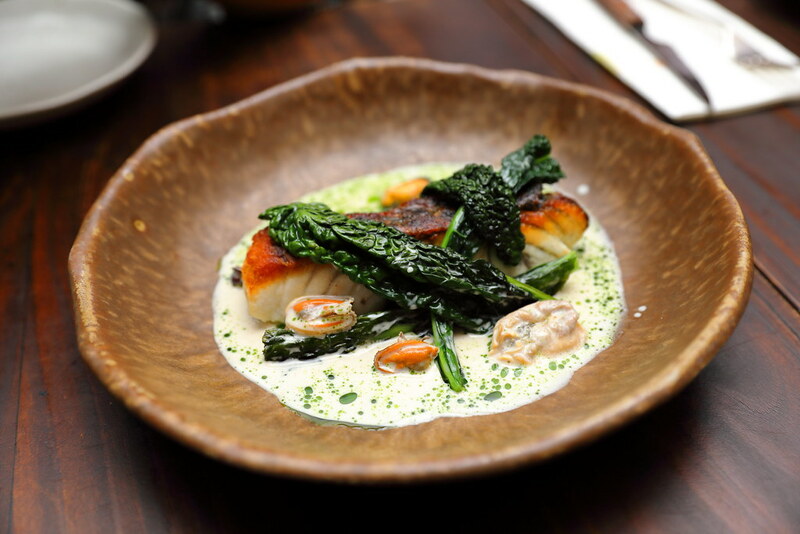 Maggie Joan's Dining & Bar celebrates its third anniversary with a new chef on board, revamped menus and refreshed interiors. Chef Seumas Smith is actually not new. He is the former head chef at Moosehead, sister restaurant of Maggie Joan's. Taken the role of Group Executive Chef, he now fronts the kitchen at Maggie Joan's. 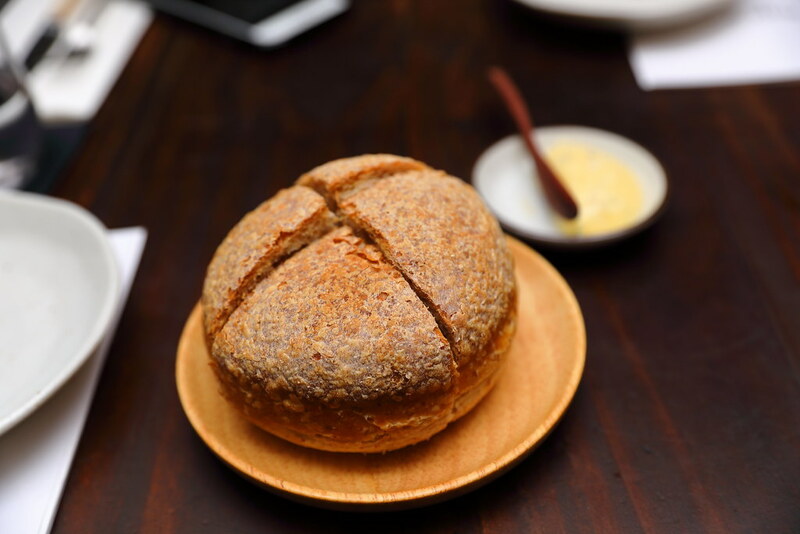 Dinner started with some warm House-baked Sourdough ($4). Besides the fluffy bread and delightful crust, what I adore is the smoked beef fat butter that goes so well with it. Light and crispy is the Shiso Tempura ($3 each). 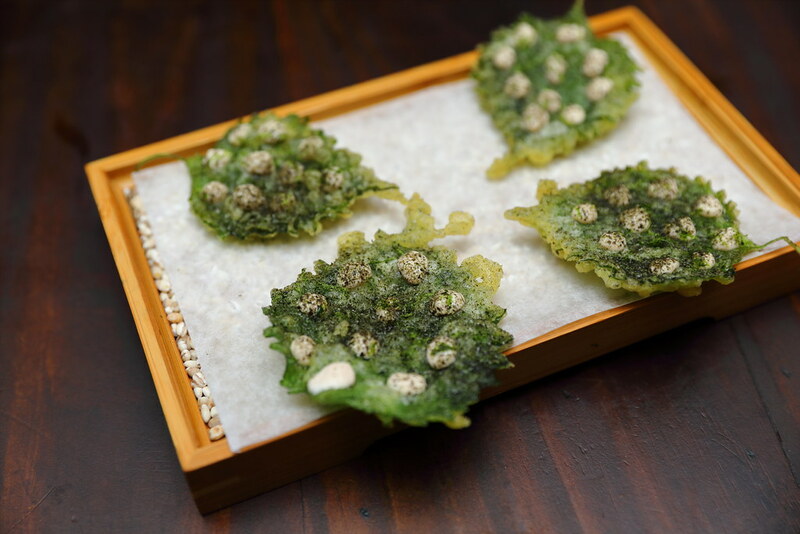 The fresh shiso leaf is coated with a light tempura batter and deep fried. The dollops of taramasalata is a blend of mentaiko, sourdough bread, garlic, olive oil and lemon juice, that adds colours (flavours) to the dish. 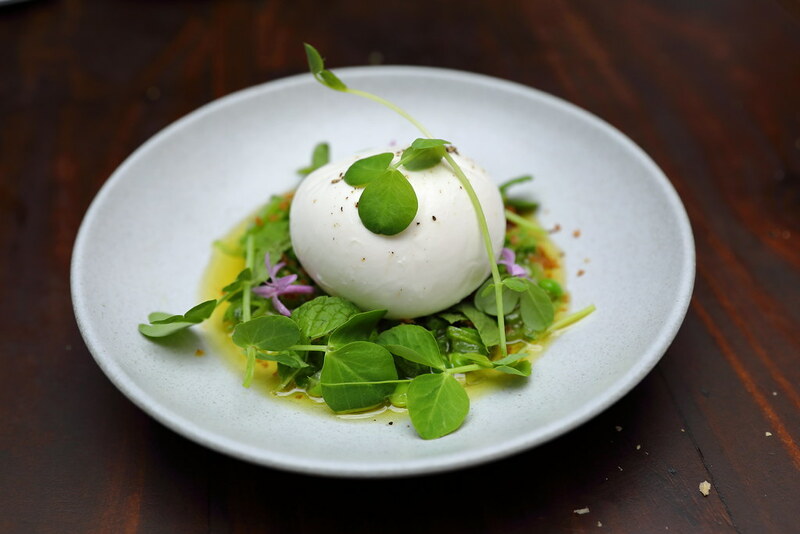 This is probably the most beautiful plated Burrata ($21) I have eaten. It comes with garden peas, sugar snap peas, preserved lemon, olive oil, breadcrumbs, pea shoots and garlic flowers. The combination works for me, brightening the enjoyment of the burrata. However I find the burrata not as creamy as those I have eaten. 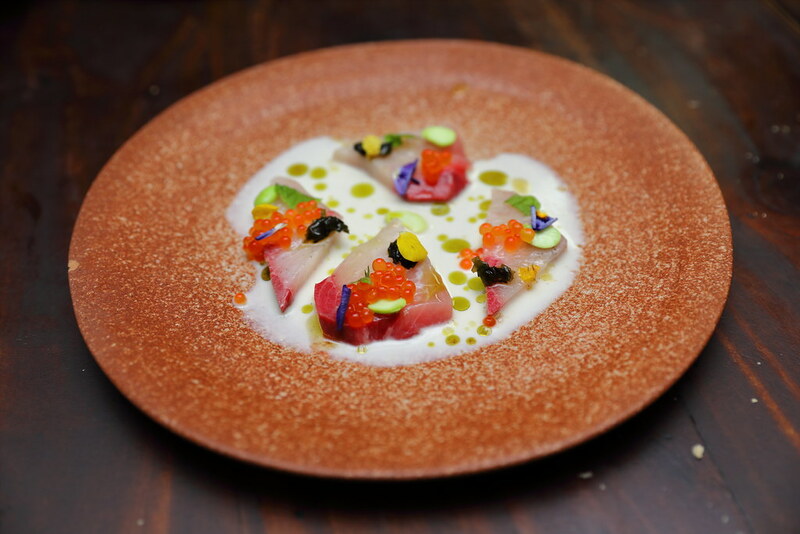 Swimming in a pool of almond sauce is the Hamachi Crudo ($17). It is topped with pickled wakame, edamame, mint leaves and trout roe. Unfortunately I felt it lacked something zesty to liven up the dish, for the fish to come alive. 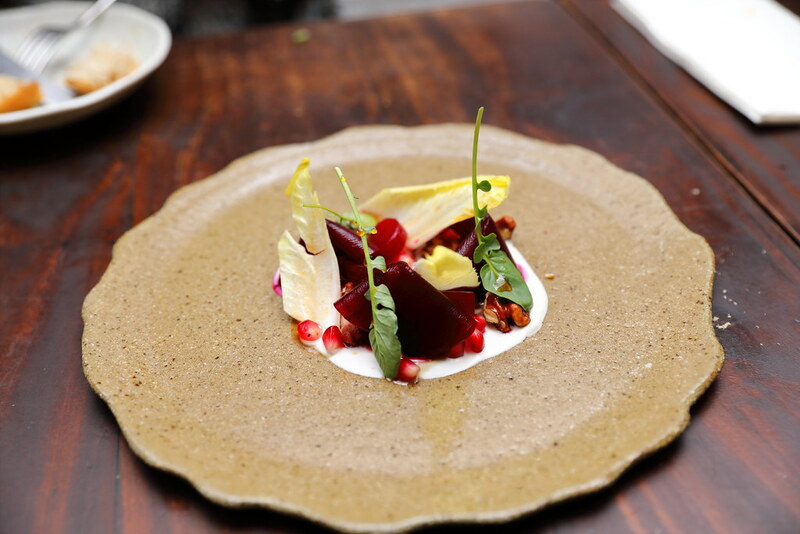 The Beetroot ($17) is done two ways - barbecued in charcoal oven and pickled in a solution of red wine vinegar. wine and sugar. The burnt honey dressing helps to balance the earthy taste of the beetroot while I like how the candied walnut provides the needed boost in texture and flavours. The Barramundi ($34) is pan seared until the skin is crispy and paired with a creamy parsley nage sauce. You can also find mussels swimming in the pool of cream sauce. What interests me is the sauteed cavelo nero in olive oil, I seldom gets to eat this variety of kale in my dishes. My favourite dish for the dinner goes to the Spiced Lamb ($44). 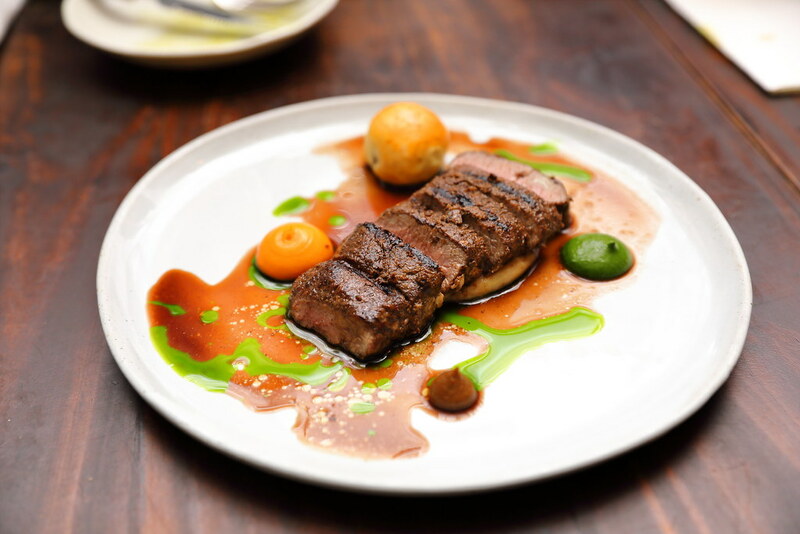 The lamb loin is rubbed with a spice mix of toasted and ground sumac, cumin and dried coriander. This really perfumed the tender piece of lamb is beautifully melded with the aroma of the spices, making me drool even before it reached my mouth. This is probably the most delicious carrot I have eaten. 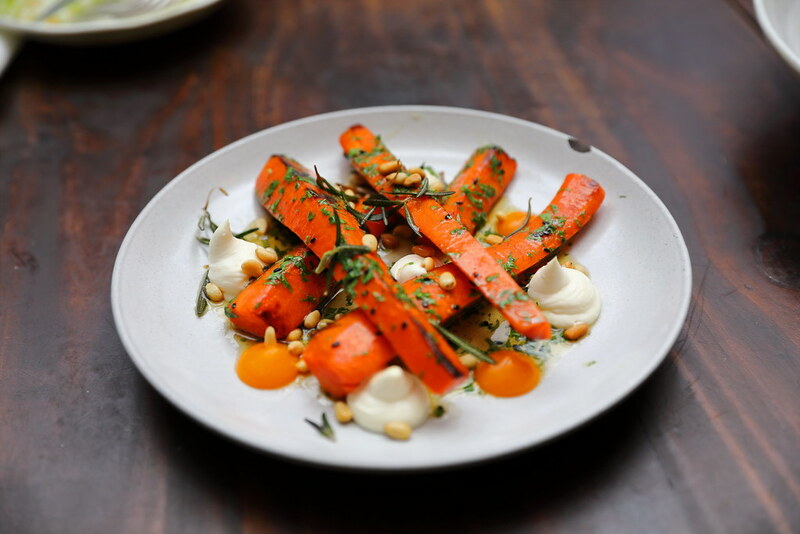 The carrots have been confit in butter before being grilled in charcoal oven. This results in the Roasted Carrots ($10) having a delightful texture with a hint of smokiness, on top of its sweetness. 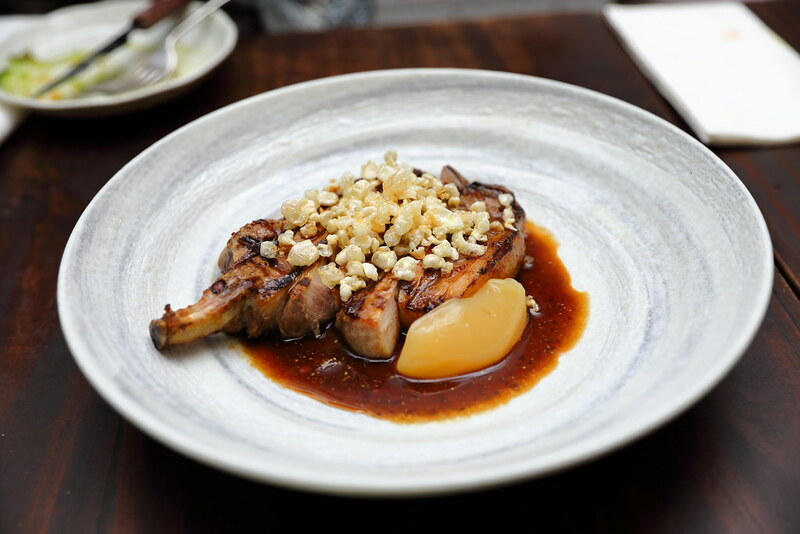 Sourced from a boutique farm in Spain, the Duroc Pork Chop ($42) comes from pigs that are fed on olives. The meat is tender with good fat marbling. The chef even added pork crackling for that extra textural enjoyment. 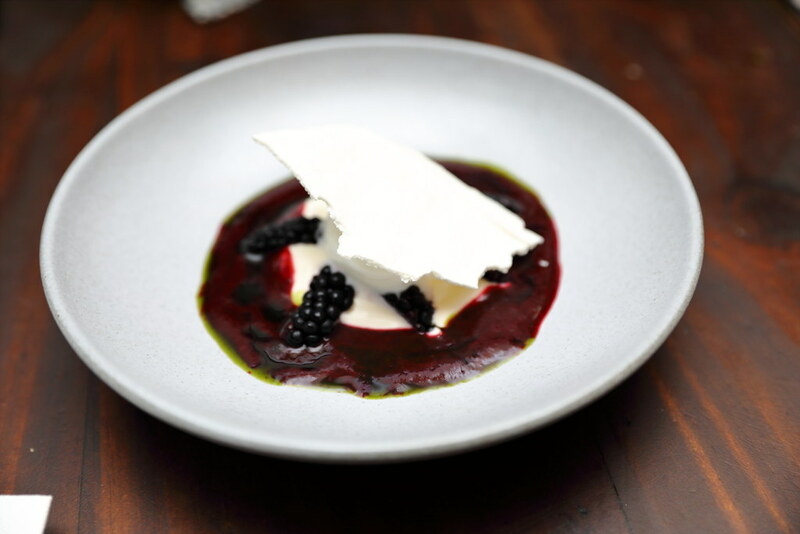 The sight of the dessert - Blackberries, Yogurt, Sorbet & Shiso ($12) did not appeal to me. I thought the dish looks messy. You really can't judge a book by its cover, the dessert turns up surprisingly good with the different components coming together, striking a balance for a sweet finish. 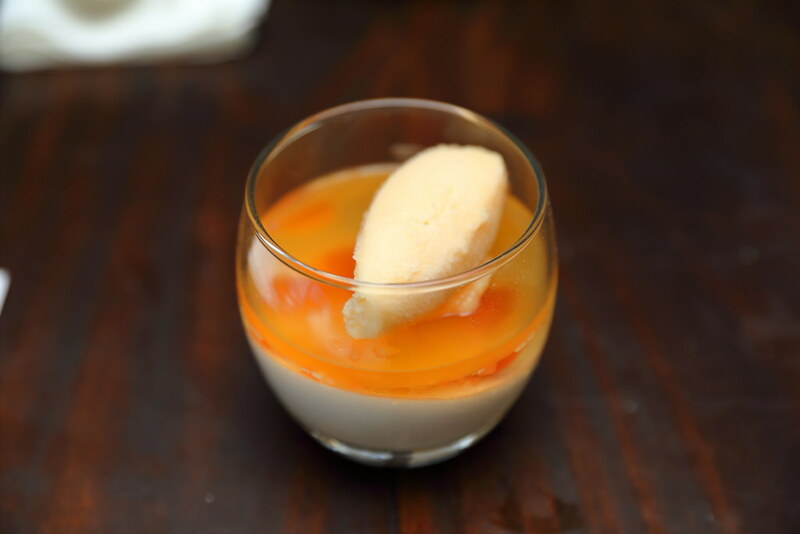 The Coconut Panna Cotta ($12) on the other hand is a light and refreshing dessert to end the dinner. 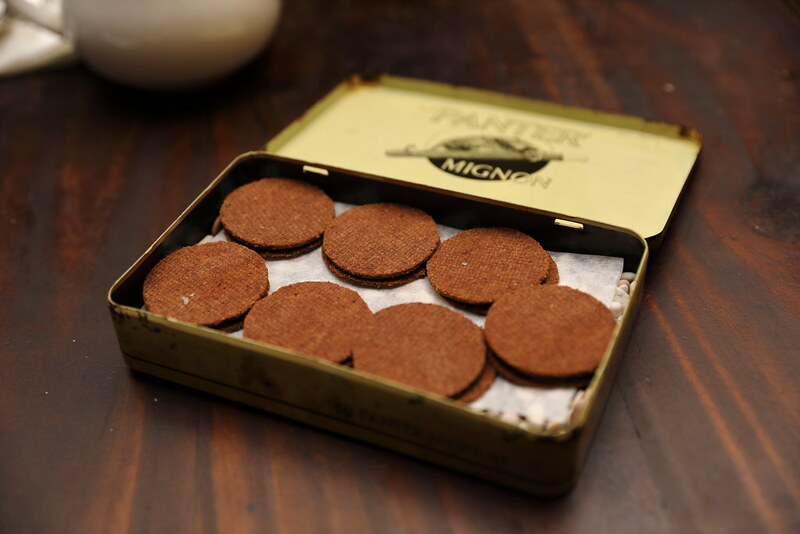 Diners at Maggie Joan's will get a complimentary Petit Fours at the end of the meal. Comes its a metal tin, diners will find Salted Caramel Chocolate Sable in it. This is really yummy. While the new savoury dishes at Maggie Joan's has been rejuvenated with a new chef on board what caught my attention is the dessert menu. Having dine here a few times, I noticed the vast improvement in the dessert. I was right when I checked with the restaurant, they have a new pastry chef on board.